The Wabbit's radio crackled and he found a quiet spot. "Receiving you, Skratch," "Break break, Pan pan," said Skratch's voice. "Roger. Priority traffic." said the Wabbit. He changed to analog short wave and switched on a reverse speech encrypter. The radio hissed back into life. "Bandits have we," said Skratch. "Rabit of Agents by over taken Rome DWA reports Dragon the Terni." The Wabbit's head span and he switched off the encrypter with a sigh. "What did Terni see?" 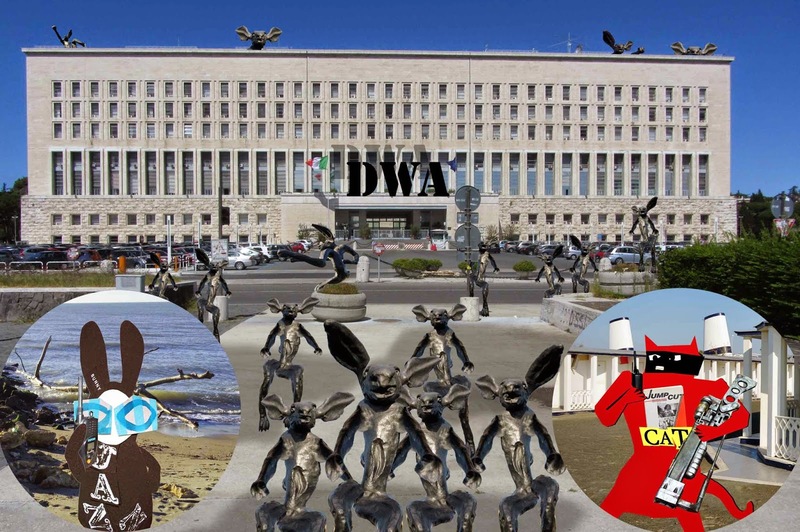 "Hundreds of Agents surround Rome Department of Wabbit Affairs," said Skratch. "The place is locked down. No-one gets in or out." The Wabbit thought for quite a while. "Hello?" crackled Skratch. "Wait two," said the Wabbit. Two minutes elapsed, then Skratch heard the Wabbit's voice issuing a series of instructions. "Terni will continue surveillance. Wabsworth, bring the rest of our Turin crew here on the double. Skratch. take the coast team and approach covertly. Do not engage." "What if they see us?" asked Skratch. The Wabbit stopped and thought. "Who? The Department?" "No, the Agents," said Skratch. The Wabbit's voice was terse. "Rome Department doesn't know we're on its patch. I didn't clear it." Skratch allowed himself a laugh. "Wabbit, I don't think they'll care." "Well, keep out the way anyway," sighed the Wabbit, "change your T-shirt and wear your mask back to front." "What about your end?" asked Skratch. "Did you find the creature?" "He found us," said the Wabbit.